Anritsu ML2496A : Power Meters - Test Equipment Connection - Prüfgeräte zu verkaufen - verpachten - vermieten. High resolution wide bandwidth power meter and sensor for radar, 3G, and 4G wireless applications. 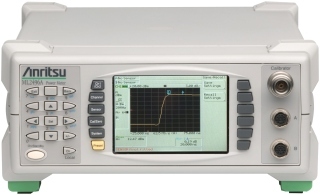 The ML2496A Peak Power Meter has been designed for high resolution measurements on radar and the latest 3G and 4G wireless systems, including next-generation systems based on complex new modulation technologies such as OFDM. They have the highest bandwidth and highest resolution in rising edge pulse measurements. A combination of an advanced sampling system and measurement features provides precise and accurate details on the transmitter's power envelope. High quality CW measurement ability compatible with a wide range of sensors adds to their uniqueness by making them universal, with all-purpose flexibility. The ML2496A supports two sensors.